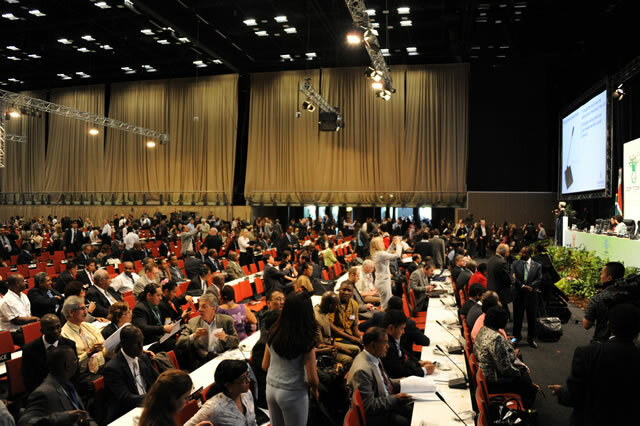 Foundation staff attended COP17/CMP7 in Durban to advocate for a climate justice approach to the negotiations. “I am relieved that the Parties to the Convention reached agreement on a roadmap towards a new legal instrument that encompasses all countries as opposed to a voluntary mechanism. The fact that the Durban Platform deal has a target of 2015 is, at last, recognition of the urgency of the issue facing us. “Now, we must ensure that the necessary political will is mobilised to meet this deadline and to increase the ambition of emissions reductions targets in order to protect the most vulnerable people whose most basic rights to food, water and health are undermined by the impacts of climate change. Going forward, issues of equity and the right to development – principles underpinning the climate justice approach – will be core to agreeing a new legally binding regime. “I applaud the leadership of the EU, the determination of AOSIS and LDCs, who, under the guidance of South Africa, pushed for a more ambitious deal. The world needs ambition to move us along the path to a more inclusive and sustainable model of growth; the Durban Platform for Enhanced Action is a good step on that path”.